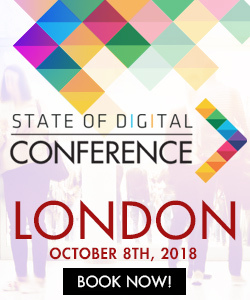 I will be speaking at State of Digital about LEEPING into a Career with Voice on October 8th and I would like you to be part of this presentation by getting involved in a survey about voice search accessibility. Many of us have heard the stats that 50% of searches will be voice search by 2020. This is really in 1 year and 3 months, not long at all. If this is true, then I would hope to see voice search being accessible for all including those who may have a disability. However there is limited data available and so I am conducting a survey to collect my own. I would be grateful if you could take part. There are more than 11 million people in the UK living with a disability. 80% of these people acquired their disability later in life, with 20% of people born with the disability. According to Gov.uk, people who are disabled, are significantly less likely to live in households with access to the internet than those who are non-disabled. These figures are 7 years old, but back in 2011, 61% of disabled people lived in homes with internet access which was significantly less than 86% of non-disabled people. If those who are disabled have less access to the internet, they may therefore be more dependant on their mobile phones. This is a platform for them to connect to others and help them lead a more independent life. However, for those who have poor eye sight or are blind, using a phone to connect to the internet would help them to carry out their daily tasks and to connect to other friends and family. RNIB said there are more than 2 million registered blind in the UK, but there could be more as not everyone registers. 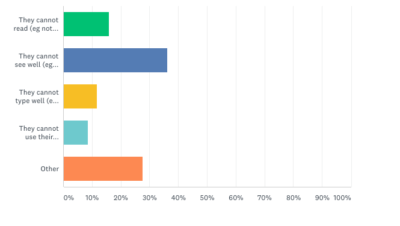 From the results of the survey so far, over 36% of respondents said those who cannot see well (they are partially sighted) would benefit from voice search. When I spoke to the RNIB, they said voice search is not something their clients would be thinking of when they call/contact the RNIB and they have no data about it. However knowing about voice search could help those who have lost their sight feel more connected to the technology, the internet and with friends and family (if they do not live nearby). Elderly people who may have lost their ability to write, type or use their hands accessing a phone/computer would benefit from voice search too. However, on sites such as Age UK, to help elderly people, there is no information about voice search. There is information about computer training but this is council dependant. I asked Age UK if they wanted to get involved but they do not have the resource to help with the survey. Out of the respondents who answered the survey, 27% said “other” would benefit from voice search. This includes elderly people and those who feel that technology too complicated. I would love to have at least 1000 peoples take part in the survey. We have information about young people using voice search and the number of voice search queries. For example Softscripts state that over 60% of those 18 – 29 are using voice search and under 40% for those who are over 54 years old. However, there is minimal information around using voice search to help those who have accessibility issues. I was surprised and happy to see Whizz-Kidz and Simply Business team up to create a voice search tool to help disabled people with planning accessible routes on public transport. 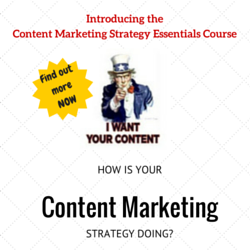 Details can be found on the Simply Business blog. Even more can be done and help those who cannot see or use their hands to access the internet and technology. Voice search should be the bridge so these people can be connected to technology and feel less isolated and more independent. However, I think currently voice search may seem too complicated for many people to use and therefore I am carrying out a survey to find out what are the obstacles people may be facing to stop them from using voice search. I’m carrying out a poll to find out if voice search can help those with accessibility needs (eg people who can’t see well or can’t use phone/computer with their hands). What are the obstacles for them to use voice search? Thank you all for taking part in the survey and Twitter poll.